Hi guys! 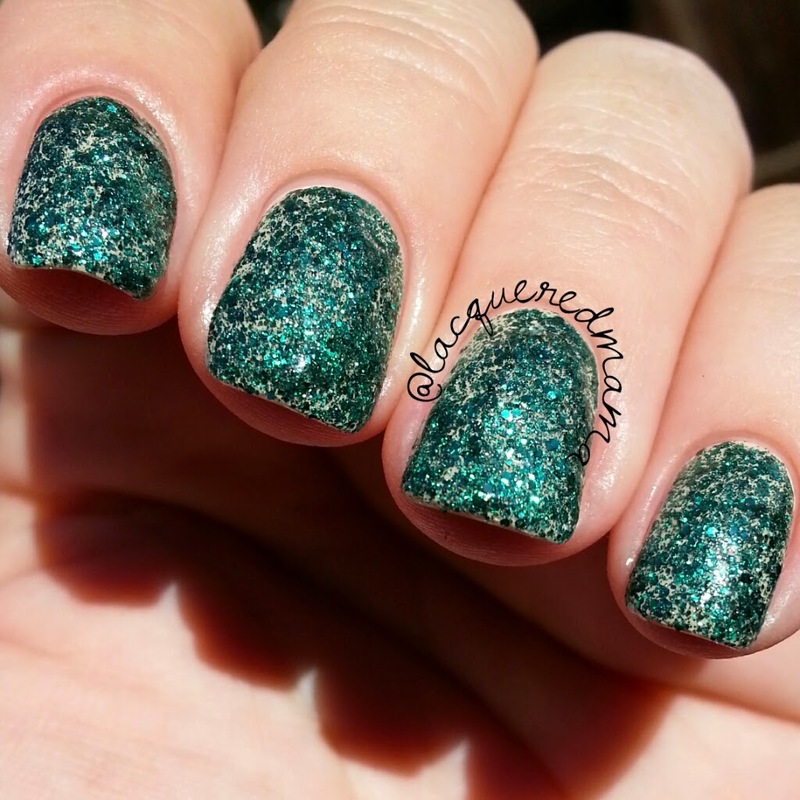 Today I have China Glaze® 2014 Holiday Collection "Twinkle" to share with you! 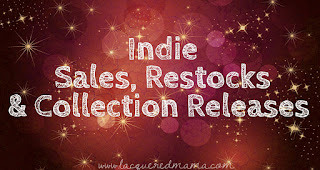 Yay for holiday collections! I mean, you knew they were coming..Halloween ends and then...BAM! Holiday music! haha! Anyway, when I received the package to review, I was pleased with the assortment; glitters, shimmers, cremes and metallic. I like when collections have a little variety to them. This is a 12 piece collection with great selection! "‘Tis the season for gathering with friends and loved ones, and dreaming of the future. This holiday season China Glaze® introduces Twinkle, a collection of shades that perfectly capture the spirit of the season, sparkles in the night sky created by glowing lights, the softness of fresh snowfall and visions of the new year. With 11 new shades and one special effects top coat, China Glaze® Twinkle collection also features nail art kits and gift sets perfect for gifting the manicure addict in your life." 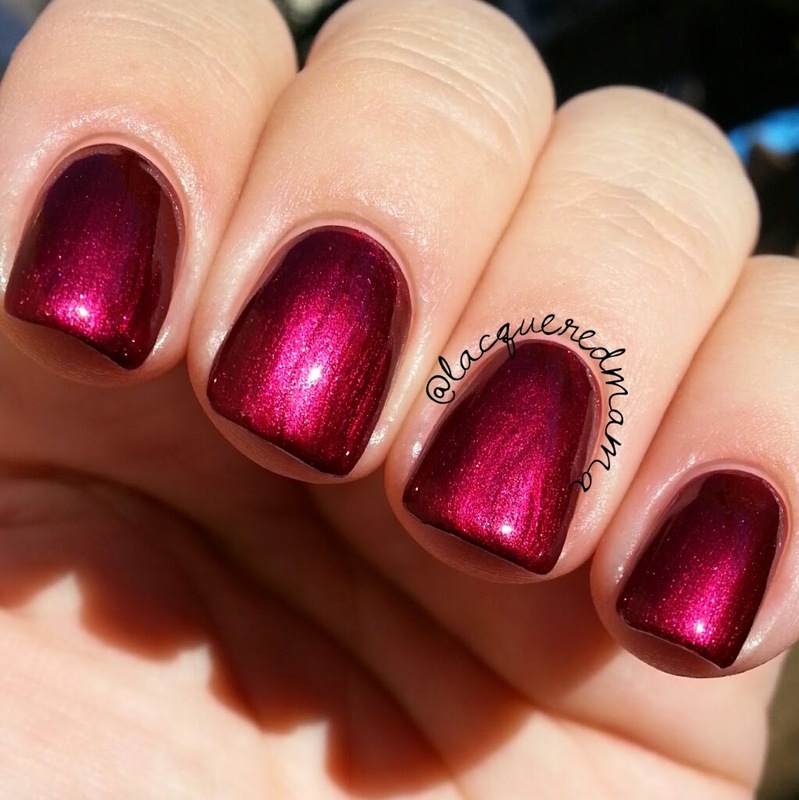 Define Good is a beautiful metallic burgundy/cranberry. First coat was a tad streaky for me, but the second smoothed it out nicely. I love burgundy and reds! This one literally looks like it's glowing, which is an awesome effect! Perfect holiday color in my opinion and I will likely wear this often. 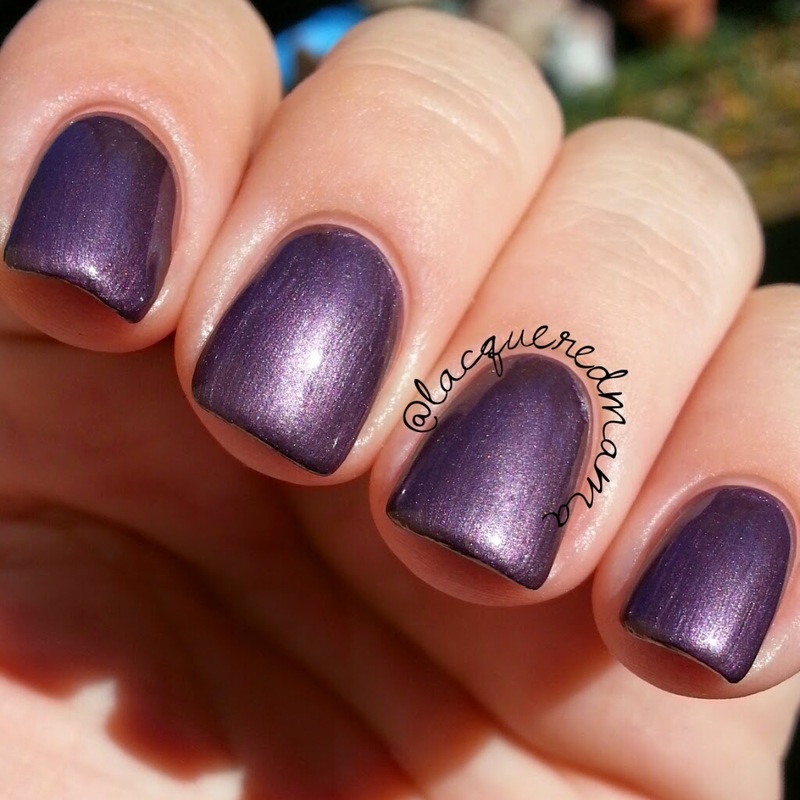 No Peeking is a deep, dusty, metallic lavender/eggplant. I really like purples, but I like them even better when they have that dusty, gray undertone. That's probably why Fall and Winter are my fave seasons. The muted colors are amazing. Again, this one was streaky on the first coat but the second smoothed it out just fine. 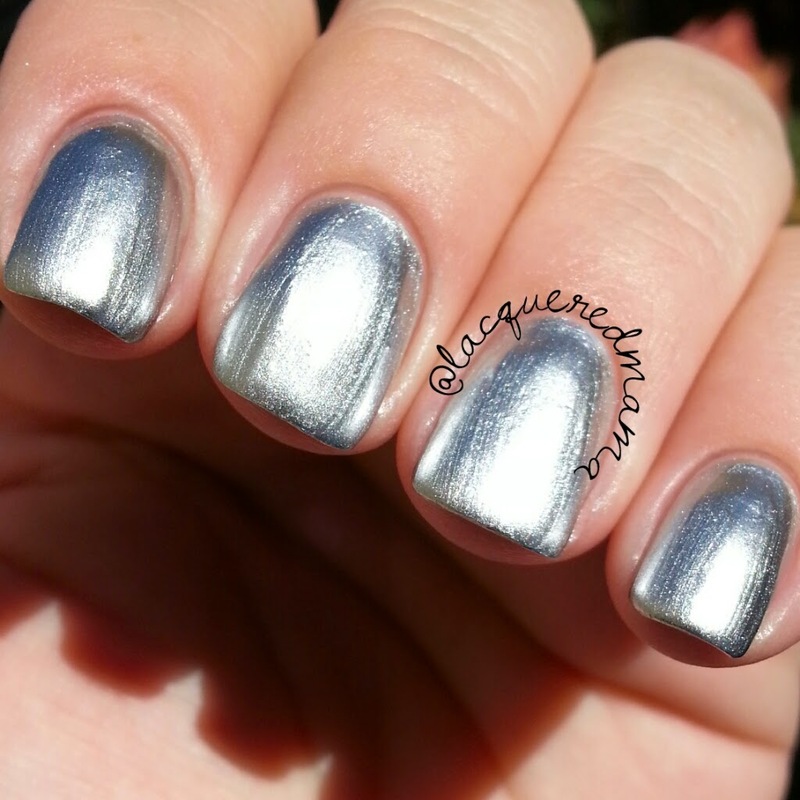 I'in Melt for You is a chrome creme, or metallic silver. I have to be honest. I really dislike chrome type polishes. I feel like they always look streaky on me and enhance any imperfection in my nail. If you have ridges in your nails, you will definitely want to use a good base coat or ridge filler. Now, it could certainly be the way I apply it, so don't take my word for it. 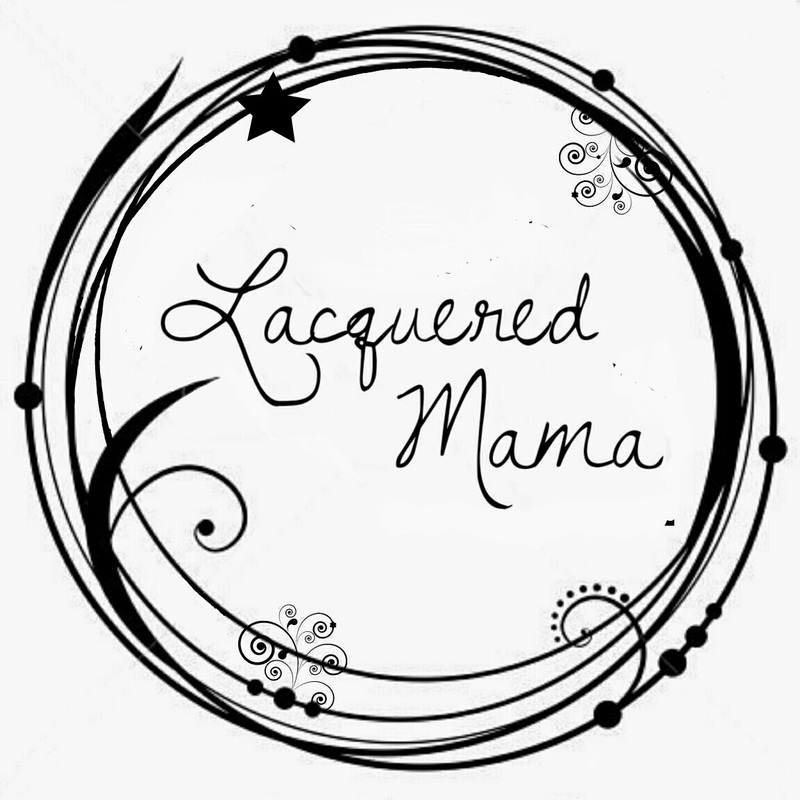 Be sure to check out other reviews to see what some other ladies thoughts are. Here I did 2 coats plus topcoat. 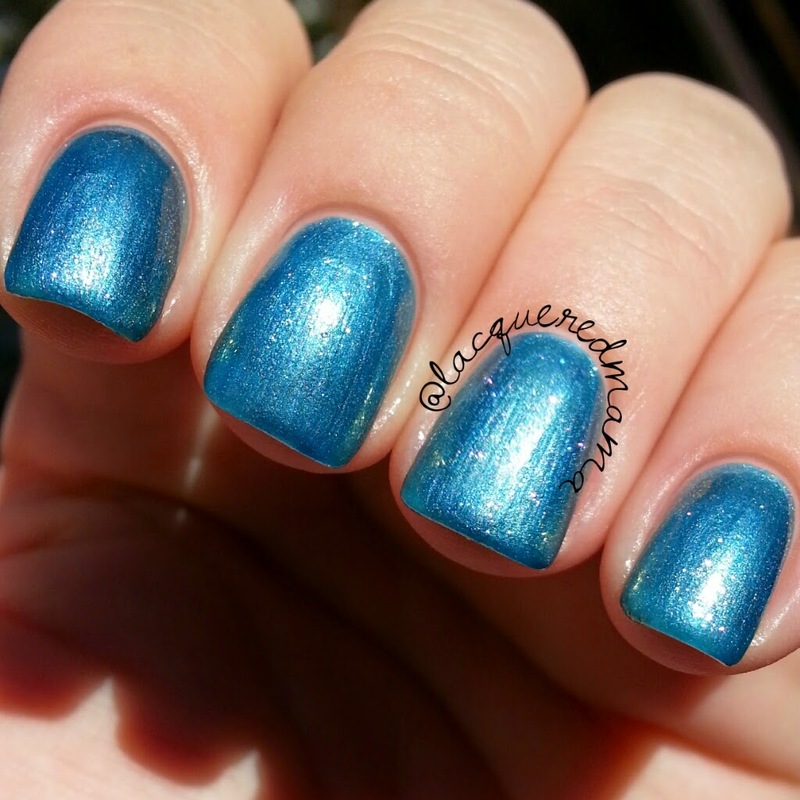 December to Remember is a metallic blue filled with some really pretty flakies that are best seen in the shade. In the sunlight it resembles a metallic with a bit of holo. It also has a bit of a lavender/pink sheen to it, but I had a hard time capturing it in my photos. I did 2 coats plus topcoat. Great formula. Almost jelly-like but I think its a creme. 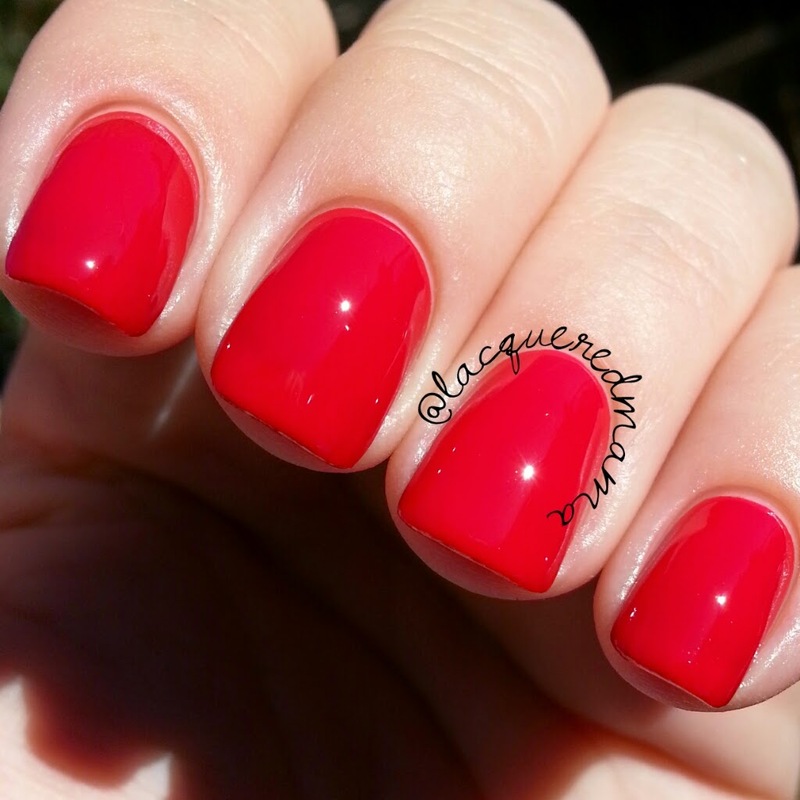 Tip Your Hat is a beautiful red creme with an amazing formula. This is a 1 coater! 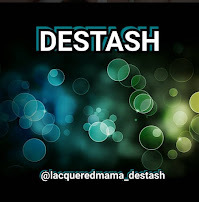 I did 2 for my photos because I'm a little obsessive, but any normal person could definitely do just 1...haha! Perfect classic red! 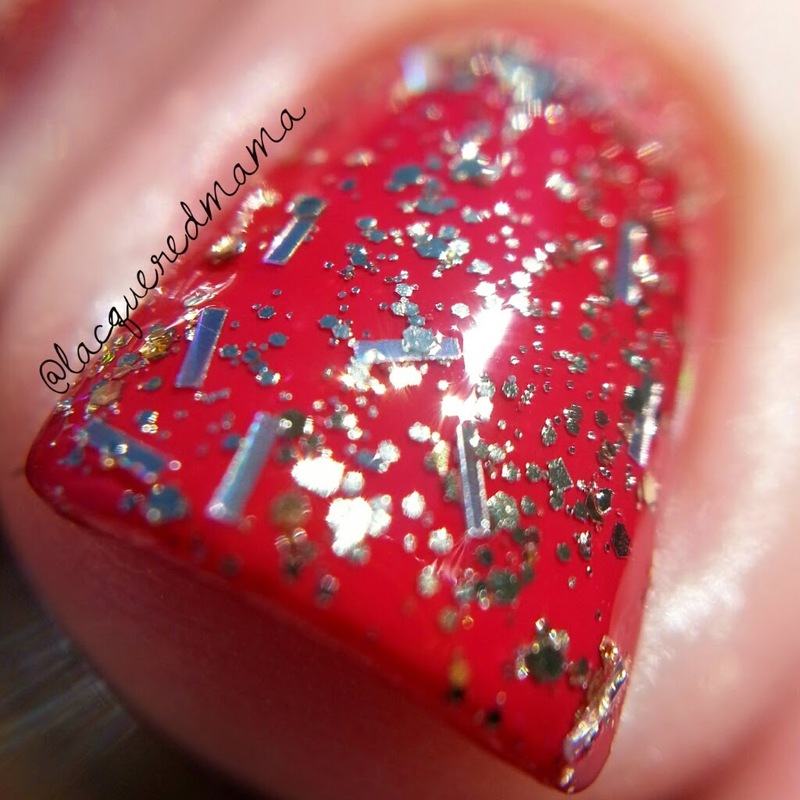 De-Light is a gorgeous gold glitter topper. This could likely be opaque on its own in 3 dabbed on coats. Here I layered 1 coats over Tip Your Hat. This had the best glitter payoff of all of the toppers. Love red and gold together! Classic holiday combo! 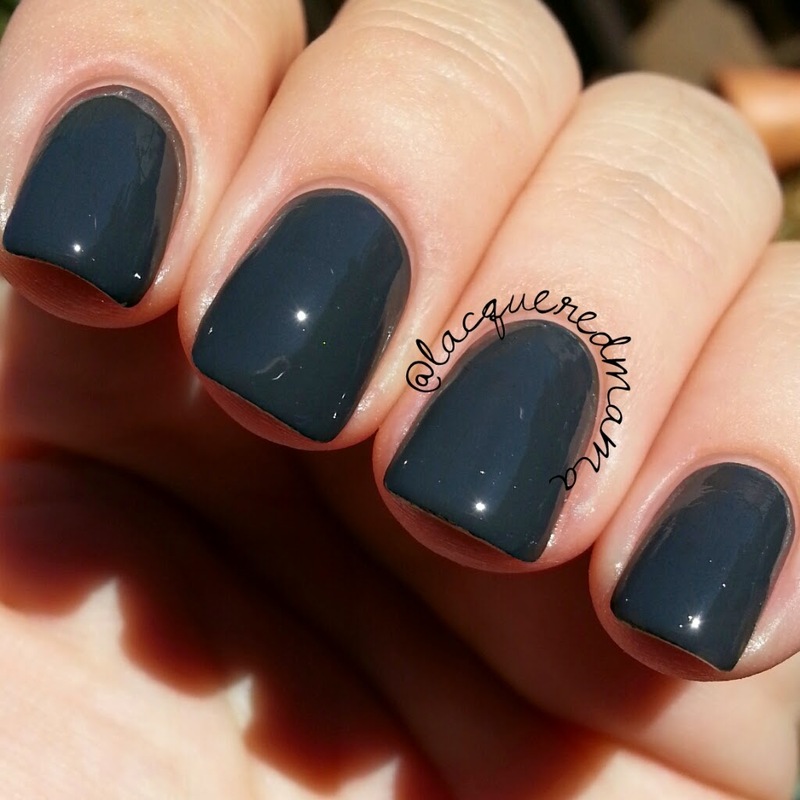 Out Like a Light is an ahhhmazing dark gray creme. This has the best formula of them all and like Tip Your Hat, it is a 1 coater! 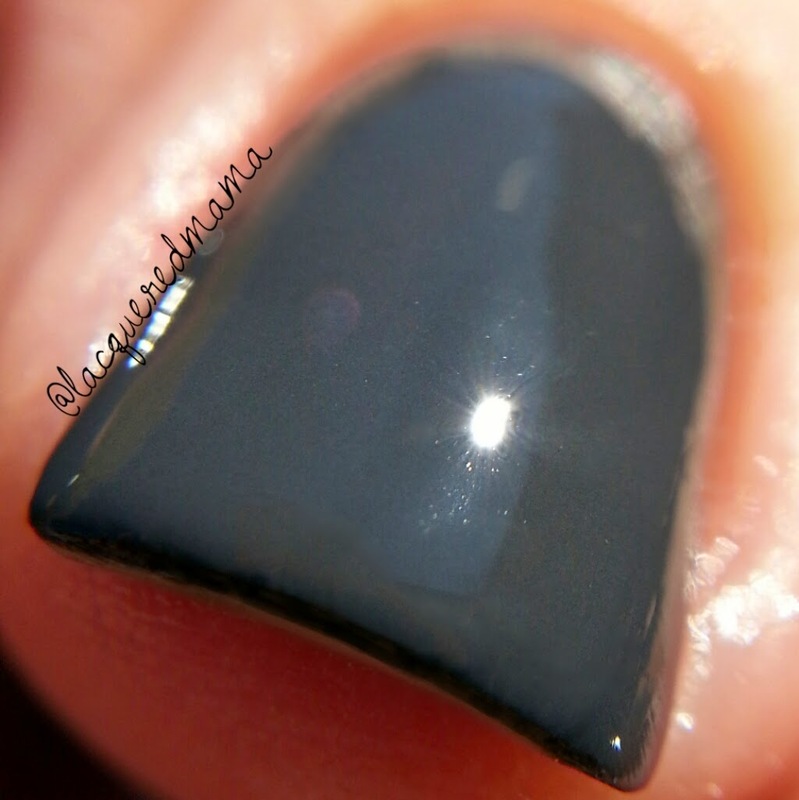 For these photos I actually did only use 1 coat plus topcoat. Love it! 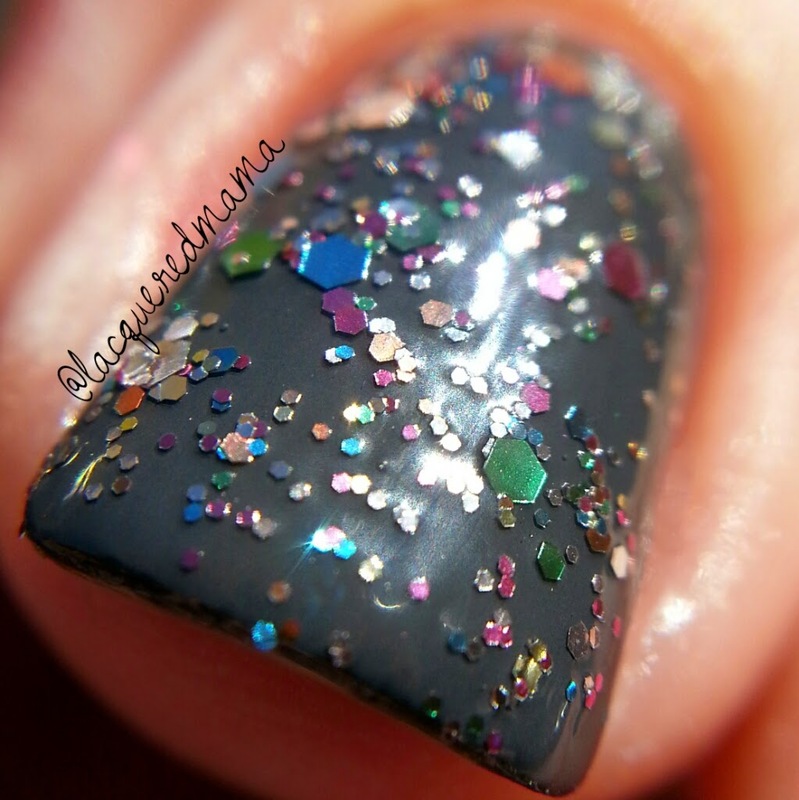 Great base for some nail art too! Dancing and Prancing is another pretty glitter topper. This is a clear base filled with silver, green, blue, pink, copper hex glitters of varying sizes. It's a great mix of colors! I did 1 coat over Out Like a Light and really really love the combo! I likes that the colors of the glitter have that muted, dusty tone to them. Nothing super bright, but really great mix for Winter in my opinion. 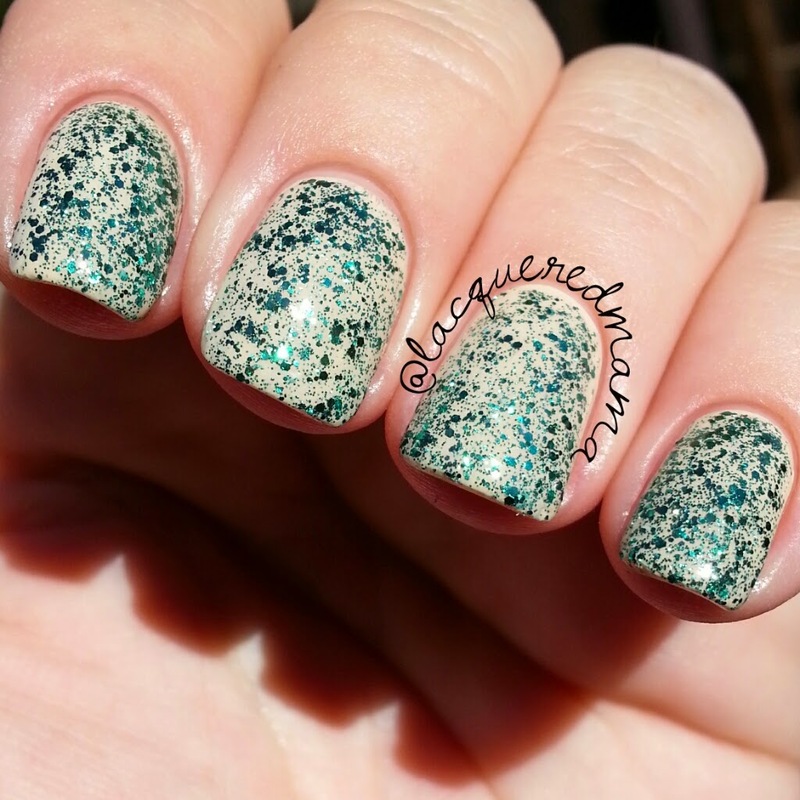 Pine-ing for Glitter is a holiday green glitter topper in a clear base. When I first saw this in the bottle, I thought it would have a little better coverage. It is more of a topper for sure, but I think you could get it opaque with enough coats. 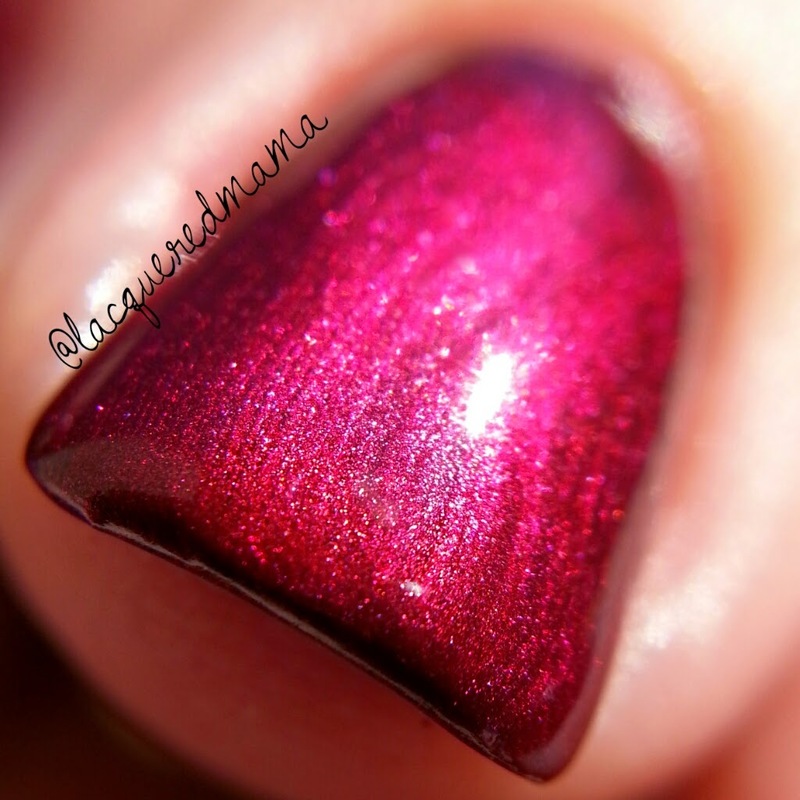 For my photos I first did 1 coat brushed on over OPI's You're So Vain-illa; for the last photo I added one more thicker coat and dabbed it on. I think 3 dabbed on coats would be pretty opaque. And I have seen other bloggers put it over black and it looked amazing! 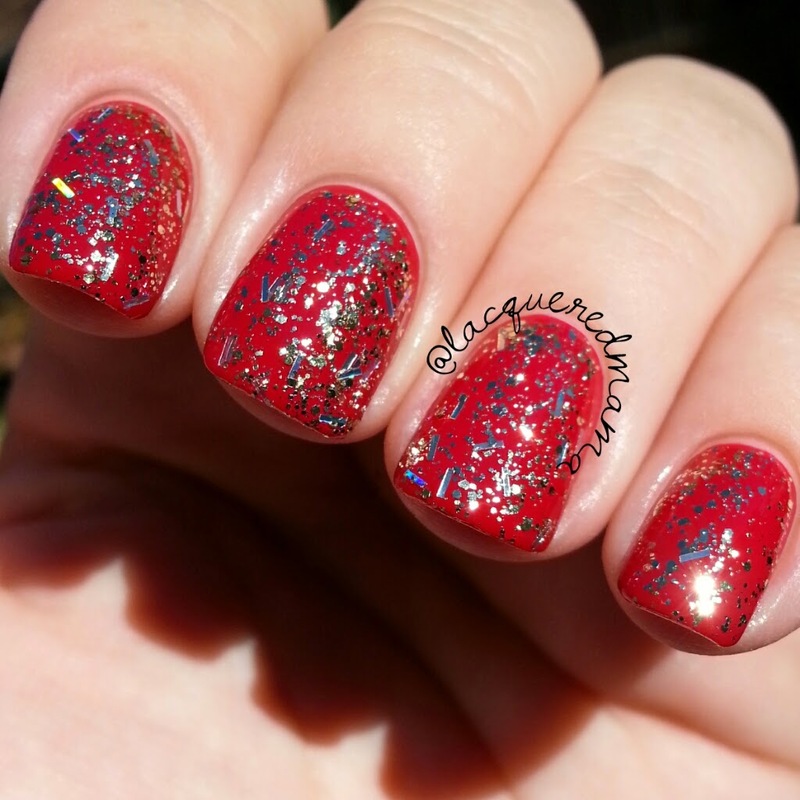 Feeling Twinkly is another pretty glitter topper. 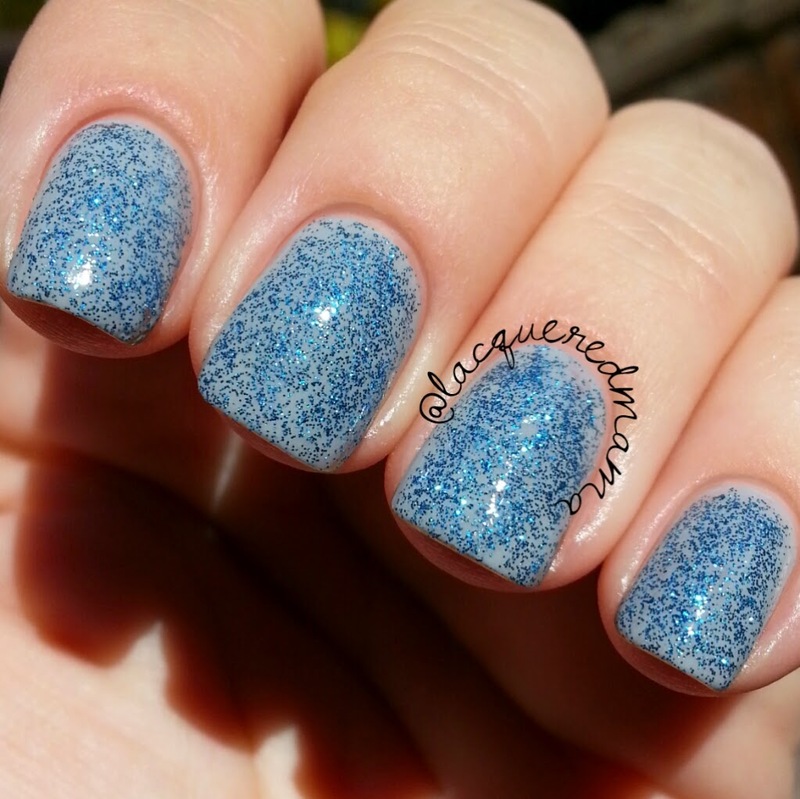 While its a gorgeous blue glitter, this one is just like Pine-ing for Glitter, in that I expected it to be a little more opaque. I did just 1 slightly dabbed coat over Luxe Lacquers Kate. You could again likely get this totally opaque on its own in 3 dabbed on thicker coats; but I have to be honest, I just didn't want to try. I feel the more dabbed on coats you do the longer it all takes to dry. Again though, it's beautiful as a topper! Chillin with My Snow-Mies is another fun glitter topper. It is a clear base filled with white hexes in varying sizes. I really wanted to love this one, but the base is so thin that the glitter slides right off of the brush making it hard to really get any. It also feels there is just way to much base for the amount of glitter that's in it. Each time I dipped my brush in and swirled it around, I only came out with like 2 of the small glitters; the larger glitters were even harder to get. I inevitably had to just place put a few blobs of the polish on paper and use a toothpick to glitter place. Eh..I don't know how I feel totally. 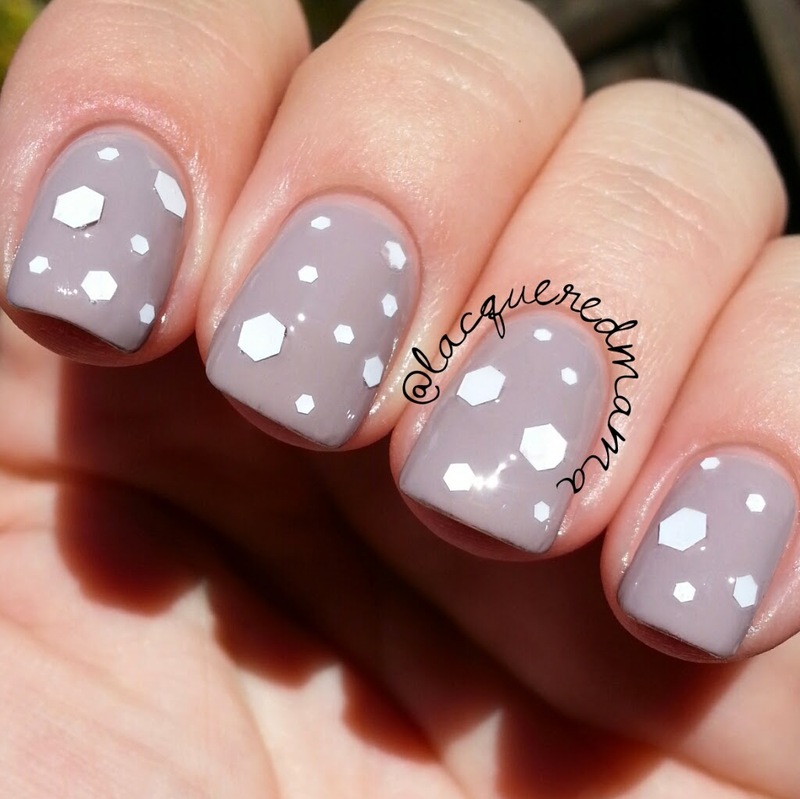 I love that they sort of look like polka dots or snowflakes, but I really dislike glitter placement. Here I did placement over OPI's Taupless Beach. 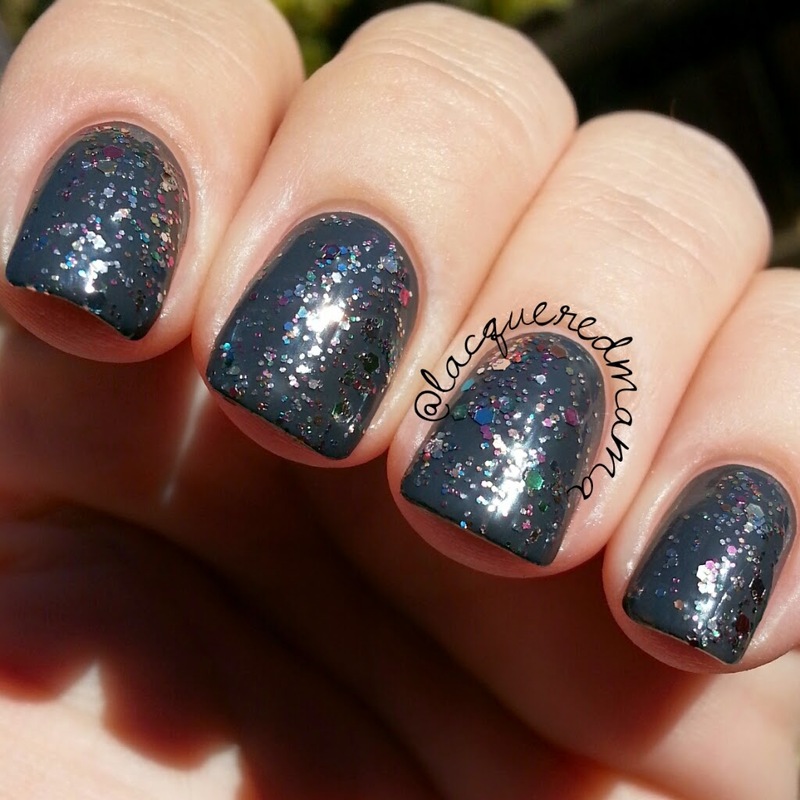 Meet Me Under the Stars is a gorgeous black jelly filled with tiny silver and black microglitter. 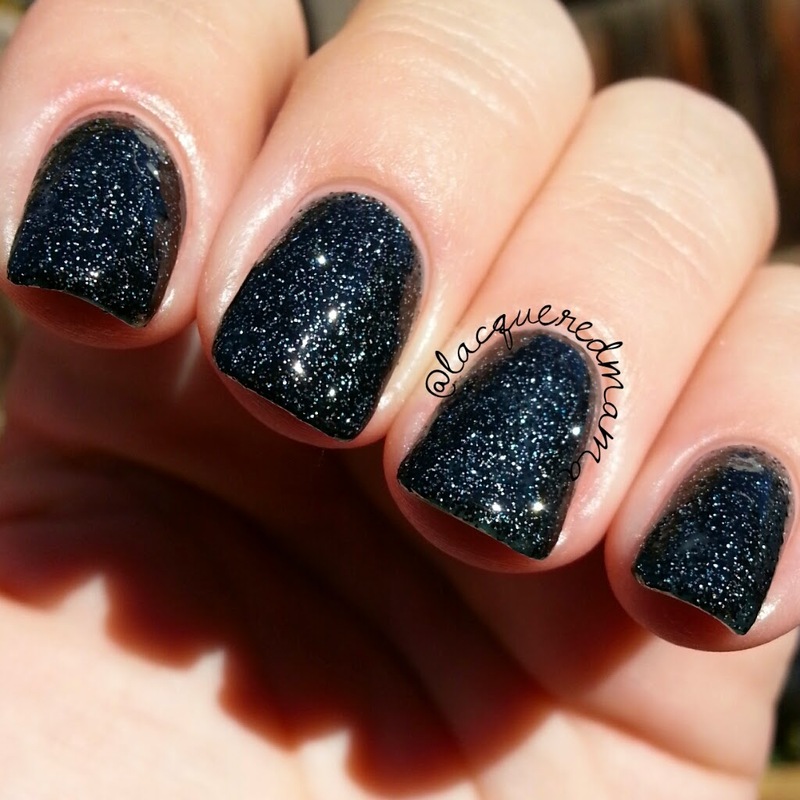 I have a few similar polishes to this, so I wasn't quite as excited about it. It is gorgeous though and the formula was ok. I did 1 brushed on coat and then one dabbed on coat to get complete covereage. 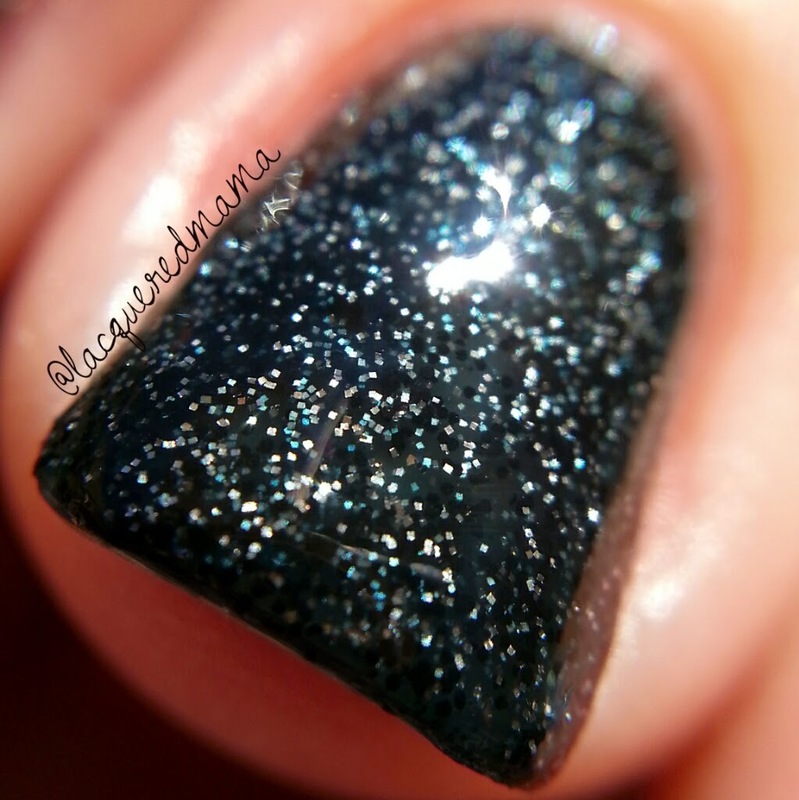 It's a bit like the other microglitter toppers, but this one is in a really sheer black base as opposed to a clear base, which is why it was a little easier to become opaque. As far as a Holiday collection goes, I think they did really well. Not too much red and green and anice array of colors and finishes. I must say that i was a little dissapointed in Chillin with My Snow-Mies. The rest of the collection was pretty good though! And again I really liked the selection of finishes and colors! The China Glaze® Twinkle collection is available this month at fine beauty supply stores and salons nationwide, including Sally Beauty and Ulta. They are also offering seaonally-inspired gift sets and kits. You can see a list of those below! Be sure to check out www.chinaglaze.com and follow them on instagram and twitter!